There are 15 posts in this thread, and it has been viewed 11759 times. How do you feel about Eight Man? 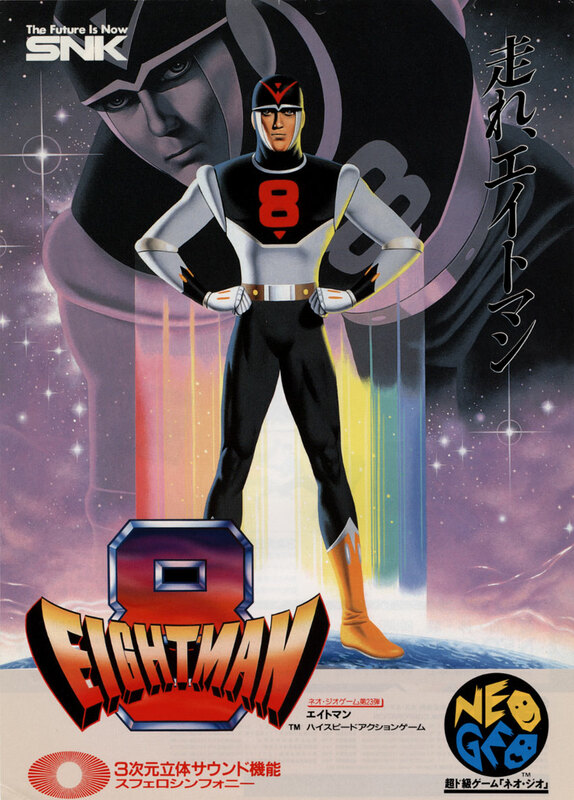 Eight Man is an early Neo Geo side scroller that was released in 1991. Although generally not that highly regarded the game does have it's fans. How do you feel about the game? Please vote in the poll and share your thoughts about the game. 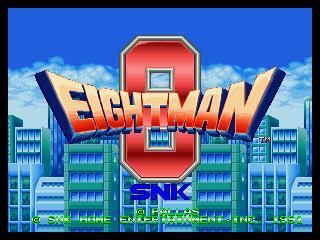 Eight Man or 8 Man is a 1991 linear side-scrolling beat 'em up released by SNK for the Neo Geo. It is a video game adaption of the manga series with the same name. 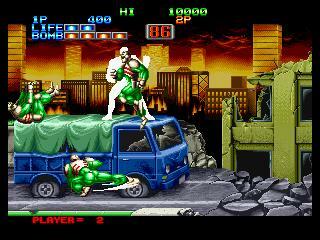 The story and setting in the game largely remains true to series as Eight Man fight robots, cyborgs, zombies, and other futuristic machinery -although it doesn't feature any of the series's villains. The game uses three of the four default buttons of the Neo-Geo. A is used for a basic punch, B is used for jumping and C is used for specials (or bomb attack). Pressing A and B together releases a spinning kick and holding down and B allows players to slide; movement is mostly limited to left or right. 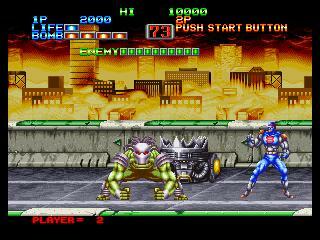 The first player plays as 8 Man while second player uses his crime fighting partner, 9 Man. lengthen gameplay. At times, the game includes simple platform jumping. The game's unique level, a scene where Eight Man is constantly running at high speeds down a highway, is interwoven throughout the game. Hey Merlin, nice of you to do GotW, since you requested Cat for you to do this, but anyway, 8-Man is kinda like Robo Army in some way. This game is actually quite a blast in my opinion. Especially with two players. Though I admit that it gets a little repetitive after a bit. Though I still think it would be great if it didn't have such a rushed and nonsensical ending. Sure, it has very cheesy bosses. But heck, what Superhero-themed game DOESN'T have that? I too am a fan of 8 man. Very chessey and fun game. Me and my nephew play it a lot. I wouldn't say it is an absolute "good" game , but I really do enjoy it. @Stray Thanks. When Cat asked me if I could do the gotw thread this week I was happy to help out. @2D Thanks chode! Hopefully kitteh will be back with us soon. try in the next few days. Would be nice to try it out in 2 player mode some time too. I am a big fan of side scrollers and really love the Streets of Rage series, but how does this game compare to that if anyone knows? Is it worth investing time and money into? maybe. But money? No. Played this back in the day and... No. Maybe... maybe if I CAN'T convince you, James Earl Jones can??! NOOO!... (Tommy<F73> No! NO!)... NOOO! -The coloring is flat and the character design is ridiculous. 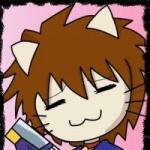 -All of the bosses are ridiculously easy to cheese and have lolerly simple attack patterns. -It's very short even for an arcade game. -It's easy: Life and bomb powerups are thrown around like confettis, and you get power-up items 'till the last level even though you don't lose them when you die. And despite all of that (or maybe because), it's fun as hell thank to the tight controls and hit detection, and the great pacing. And quite shamefully, it is the only Neo game I have 1CCed... yet. I'm gonna jump in late since I just got this game earlier in the week. I laughed pretty hard when the Predator showed up. I had forgot he made a cameo lol I actually thought the levels where you are running and guys are jumping in from the foreground and background looked pretty neat. I'd like to see that expanded upon. 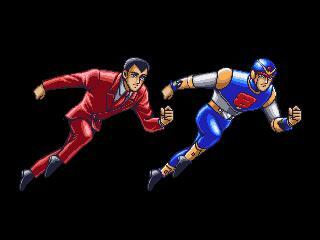 To be honest as many of you know I have a soft spot for beat'em ups. You move left to right and hit things and it does that, so I can't complain. Good for quick sessions when you don't want to think to hard or employ any kind of strategy. My only real complaint I have about the game is that it really has no ending. but that's just me loving and wanting to see more 2d art. Overall I'd say check it out, but your mileage may vary. How long is this game? How many missions are there? Not a bad game at all, though it's not exactly gonna change your life, either. Nice, colorful graphics and decent audio but certainly nothing that pushes the hardware all that much. The gameplay, while shallow in depth, is simple and solid enough. It's fun for a quick session and the difficulty is rather easy for a Neo Geo game (nice not to be brutalized every now and then). Some may criticize the game for being short but honestly I think if it were much longer, the repetitive nature of Eightman's action and gameplay would begin to test one's patience and make it progressively less enjoyable. Haven't had the chance to try this out with a second player but I'd imagine it'd be a lot of fun to blaze through Eightman with a friend before moving on to a deeper, more competitive session of SS or KOF. That's pretty much how I feel about the game too. Quite fun for a quick session now and again but wouldn't make it into a top 20 list of my favourite Neo Geo games. I still need to try this in two player mode though. Hope to see you posting a few scores again Chiba. The high score challenges have been very quiet recently. It is a fantastic platformer for an early 1990's arcade in a shopping mall, but that doesn't necessarily translate into a fantastic home platformer. The game has a unique cheesiness to it and a nostalgia factor. However, I don't know that those qualities justify a $90 to $250 price tag you would be paying to own it.